Locally Grown Chard, Celeriac, Butternut Squash & Cardoons!!! Butternut squash has been available from some farmers for a couple of years, but supplies are always erratic. These ones from Bukidnon were SUPERB, sweet and intense, not as watery as some tropically grown versions can be. I am a huge fan of butternut squash, and as I will show in a post up soon, they are SO EASY to cook! that is amazing to have these veggies available there now. Good to know. But I usually use the swiss chard in my beef soup. Will be watching out for your recipes and for the butternut squash, I just pop this in the micro with butter and brown sugar. Could use other ideas on how to cook it.What is a cardoon? It’s good to know butternut squash is already available in Manila. I see it in a lot of cookbooks! My favorite thing to do with butternut squash is risotto. So nice and creamy. Even with only a little parmesan. Awesome!!! Looking forward to having them available here in Cebu too!! I use the butternut pumpkin for my roasted pumpkin soup. this is great…I did found this squash before in SM Mega grocery, or Unimart (?) (sorry can’t recall) but didn’t know any dish for it. Will wait for your recipes! Do they cost a lot more than regular squash? cardoon!!?? this time, i learn from you (again), MM…google time!! This is great news! Thanks for the heads up! I roast butternut squash with EVOO and mixed it with baby arugula! superb dinner or added to a pumpkin soup. I love Celery root added to my mashed potatoes! That chard looks GREAT. Will look for the squash tomorrow, should go nicely with the roast pork I have planned for dinner… yum. OMG…butternut squash! I have to get some of those in SM Makati!!! Thank you for the news! I have been missing this item very much, since I moved back from Boston in 2005. Makes for really good pie! I grew up in the pineapple plantation in the plateaus of Bukidnon. The climate is cool (similar to Baguio) and the soil is rich in nutrients. If you have never visited the place, you really should go!!! Hi MM, i love butternut squash. I did meet the man who grows these some of vegetables for Dizon Farms (I think his name’s Franky), he might be the son or grandson of the owner. I love their assortment of vegetables, especially the more exotic ones. I have to check out SM Makati for this, I usually shop at the Market Market branch. The Swiss chard: variety is called BRIGHT LIGHTS!…excellent sauteed with garlic, shallots, white wine, pancetta, a little cream(optional), parmesan cheese, herbs and tossed with pasta! The leaves..texture much like spinach or pechay. I use them to wrap a fish mousse i muffin tins…Blanch quickly in salted water and pat dry. Then make a fish mousse, Line the muffin tin with the chard leaves and pack in the fish mousse. Steam until done. Serve with a tomato coulis. 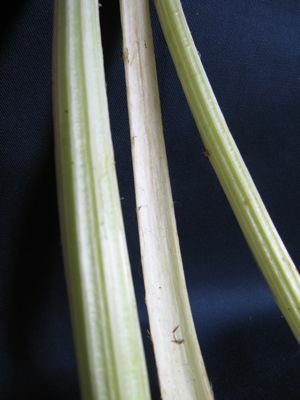 The stalks….cut them to 1 inch pieces and saute with bacon or pancetta, garlic, shallots, herbs in olive oil. Make a bed of the sauteed stalks and place the fish mousse on top of it and drizzle the tomato coulis. from down south, MM, not “up north”. next to davao, bukidnon is one of my favorite places. I would give my right arm for any or all of those vegetables, all of which were regulars at our table when we lived in northern California. It’s the chard (and other, ‘Western’ greens such as dandelion. lamb’s ears, and collards) that I miss the most, here in Asia. How I wish farmers in Malaysia’s Cameroon Highlands had the foresight to expand their product lists! We are lucky to get arrugala and radicchio – at the grocery store – and half the time I get it home and remove it from the package only to find it mostly rotten. MM, you are one lucky guy! Once again the quality and quantity of ingredients in the PHI surpasses that of those in Malaysia. Why? Who knows. Robyn, oddly, the western veggie selections in Vietnam from the highlands were also amazing, artichokes, etc. In the Philippines, the improvements in the past 10 years have been very very encouraging. In many cases, large growers target exports to HK, Taiwan and Japan and we “benefit” by getting the “excess” sold in local outlets… Now if only they had broccoli rabe, some chervil, parsnips, hmmm…. :) millet, I meant the vegetables were looking tired due to their arduous journey going north to Manila :) bettyq, I cooked steams and greens separately, they were pretty good. kurzhaar, I think the cardoons are a bit past their prime, but may still try them with a dip… Jade, the lady from Dizon said their fruits mostly go to Market!Market! and the veggies to other outlets like SM. diwata, I would love to go to Bukidnon someday! But I need to avoid pineapple plantations as I am allergic to them. 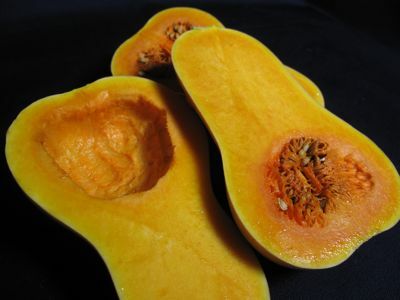 Ryuiki, you might also sometimes find the butternut squash at the Herbana Farms stall in Salcedo market every so often. myra_p, I had to “refresh” the chard for the photo with a dip in iced water… and yes, it did look good after the cold bath. Ann, I like that idea of sweetish squash with slightly bitter arugula, thanks! Joey, I know you are a huge butternut squash fan… natie, first time for me on cardoon as well. michelle each medium sized squash was PHP80 or so. More expensive than local kalabasa, but worth the difference in price for that occasional splurge on a great tasting vegetable. juli, I like the risotto option as well. Farida, chard in soup is so satisfying! Robyn, I agree with you…greens are probably what I’d miss the most. Fortunately I can grow my own. Marketman, I know you claim to have a “black thumb” but I’d encourage you once more to try growing your own greens. (makes cheering noises here) :) Or commissioning a local farmer to grow some–if you supply the seeds perhaps? Cime di rapa or rapini (=”broccoli rabe”) is one of the easiest greens to grow. 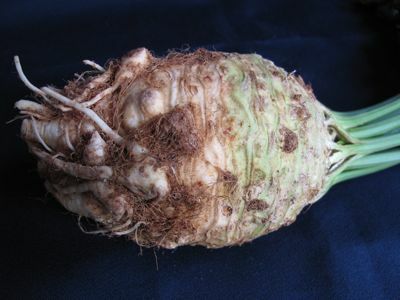 It is actually a non-bulbing turnip (I find a lot of people are surprised by that). I grow rapini every year, different varieties. It’s possibly my favourite green of all, I can eat it every day when in season (not an exaggeration). Sauteed with olive oil and garlic and perhaps some pancetta, toss with cooked pasta and optionally breadcrumbs crisped in olive oil. Delicious and GOOD for you! Marketman, forgot to ask, did you get the cardoon root as well as the stems? Also, please warn your grower, cardoon is notoriously invasive (as all members of the thistle family) and they should NOT let it go to seed!!! 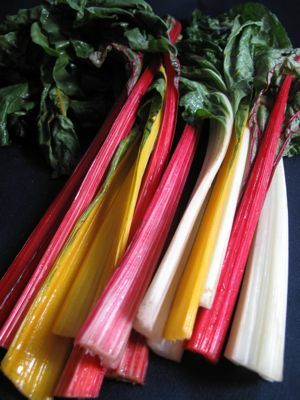 bettyq, I like that chard with all those other ingredients and then tossed with pasta. Thank you for the great idea. by the way, I tried your famous chocolate cake recipe and it is very moist and delish. Only variation was the EVOO as I did not have any canola oil handy at the time. I was surprised I did not smell the oil at all. And thanks for the tip of soaking the shrimps in brine first…it really works. Swiss chard, or more commonly known here in Melbourne as silverbeets, is quite abundant here year round. The leaves actually freeze well and I have used it as substitute greens for my sinigang (especially if I feel too lazy to drive 20 minutes away to the Asian shops just to pick up kangkong). I’ve used the stems for making veggie stock. At the moment, a bunch of about 7-10 stems cost about AU$2.50 at the local greengrocers. Farida: make the brownies…even better, sub the melted butter with olive oil. It is very subtle and hindi mabigat sa tiyan! Unless you bake it in a smaller pan, double the recipe since it is rather manipis! Did you barbecue the shrimp/prawns? or make them into all shrimp or prawn wontons. Isn’t there a tagine post (or several) somewhere in the archives? Cardoons in a tagine is an incomparable treat. Every spring, when cardoons become available here in Chicago, I make sure to visit a local Algerian cafe (Tassili) for this once-a-year-for-us pleasure. I use swiss chard and celery root for sinigang. It is so delicious! I tried this from a Filipina acquaintance and it sure tastes a lot better than the usual Filipino vegetables we put in the sinigang and I have stuck to this recipe eversince because it just makes the sinigang broth so full of flavor! Dizon Farms has been around for ages. Their Suha/Pomelo is one of the best and they are all over the archipelago. Thank you Dizon Farms for cultivating these known Western veggies to our tropical paradise for the locals, visiting or planning to move back to Mother Land after been gone for awhile to savor and enjoy these familiar veggies to her sons and daughters. It’s been a very busy and stressful year. The only place in Chicago to buy top-quality cardoons in very very late winter (in weeks leading up to Easter) is AFAIK Caputos, which is an old Italian supermarket now serving a broad multi-ethnic clientele. (I have also seen it intermittently during same season at Andy’s Fruit Ranch in Albany Park). It is an ancient and a quintessential Mediterrean vegetable and wonderful recipes for it could be found in many old-fashioned Italian cookbooks. I think Mario Batali might even have a couple of attractive, updated ones in his volumes. After school, when I first backpacked through Spain years ago, I ate a stunning meal in delightful Cuenca which included a marvellous morteruelo (a kind of pate of diff game meats ground together: hare, venison etc) plus “setas con cardo” (wild mushrooms cooked with cardoons/thistle). A quick google just now on search words “cardo recetas” yielded many intriguing Spanish recipes using this veg. The Maghrebi word for cardoons is I think kharchouf which is confusing bec one would think THAT sounded more like “artichokes” (which is also a Cynara, but is called kok beldi in Morocco). I think this tagine is usually made with veal, although Tassili makes it to great effect using high-quality beef. A few slivers of home-made preserved lemon is essential to give the tagine that unmistakeable piquant je ne sais quoi. Quick google on “tajine aux cardons” might give you a good headstart on a reliable recipe. Say hi to Mailin for me. Interesting post. Also found this link through the Specialty Produce Fan Page in FaceBook. Found out, for example, that cardoons can take the place of rennet in making cheese ( not with cow’s milk though). The vegetable colors are so pretty! And as for the cardoons, the first time I ever saw them was in a book from Time-Life’s The Good Cook series. Local growers should really look into these special vegs! A couple of years ago, I did some research in Morocco for a magazine and this is from the (unpublished) material. The specific variety of Cynara involved is still unclear to me: it is probably not cardoons but another kind of thistle. Traditionally, pancakes such as mlawi and msemen are sold out of a mehlaba (lit: “lieu de lait” i.e. a cremerie, a purveyor of fresh milk and milk products) although today this is not necessarily so. It is in these mehlabas that one can enjoy an early morning glass of rayib (also sp: raib, rryib, Wolfert has raipe), fresh milk mixed with a few spoonsful of fragrant orange flower water and a little sugar and then lightly curdled into a soft yogurt-like consistency. I have wonderful memories of standing in a mehlaba in the Meknes medina slurping creamy rayib in the company of with market-porters and laborers on their way to work. Traditionally, rayib is curdled with the vegetable rennet of the dried wild thistle called “kok beldi” (also sp: Wolfert = coques) (Cynara humilis or perhaps Cynara cardunculus). This is almost certainly a variety closely related to the wild thistle/artichoke that is used to make cheese in Sardinia and in many other parts of the Mediterranean. I am almost certain that it is the same thistle used to make my favorite Spanish cheeses, the Torta del Casar (http://www.tortadelcasar.org/ingles.html) as well as the Torta from the neighboring village of La Serena (http://www.tortaserena.com/). At the end of my trip, I stopped by Formatgeria La Seu in Barcelona (a great champion of Spanish farmhouse cheeses: http://www.formatgerialaseu.com/) where the owner Katherine showed me her stash of dried thistle. We both agreed that it must be the same thistle. Nowdays, however, most Moroccan mehlabas simply use an enzyme/microprotease in the form of a pill called asproya (marked “caille lait” milk curdler) that could easily be bought (for 1 dh) for home use from any corner store. A pill curdles one liter of milk (I was told). I just love butternut squash and the ingredients that you’ve listed. I have to contact Dizon Farms for that. Thanks. Love your comments about cardoons. My husband and I plan to start growing them next March or April here in Cork, Ireland. Seeds are available from moreveg dot co dot uk – I think, for the moment, Europe only. We have been growing chard for the past few years – a great plant yielding two dishes in stems and leaves. It is important to keep the old heritage varieties going, and groups like Irish Seedsavers are to the fore in this important work.